A multitude of coloring products makes you dizzy? We will clear up all your doubts about choosing the right product for your hair. 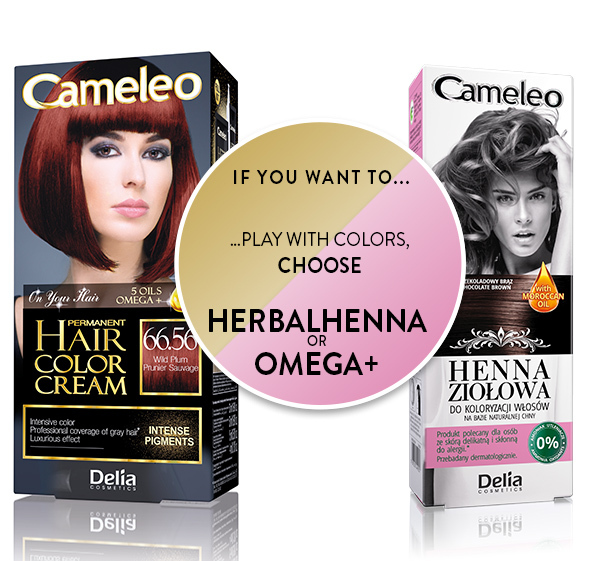 Learn more about our two picks – an all-time classic Cameleo Herbal Henna and a new permanent hair color from Cameleo, Omega + . 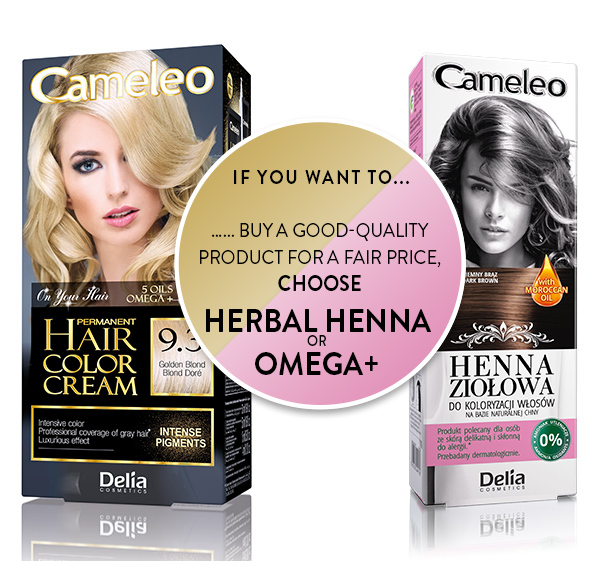 Herbal Henna is a unique product for hair coloring. The most important difference when compared to the classic hair dye is the lack of ammonia and hydrogen peroxide developer. Herbal Henna is based on the oldest natural pigment, Lawsonia Inermis, and carefully selected colorants. 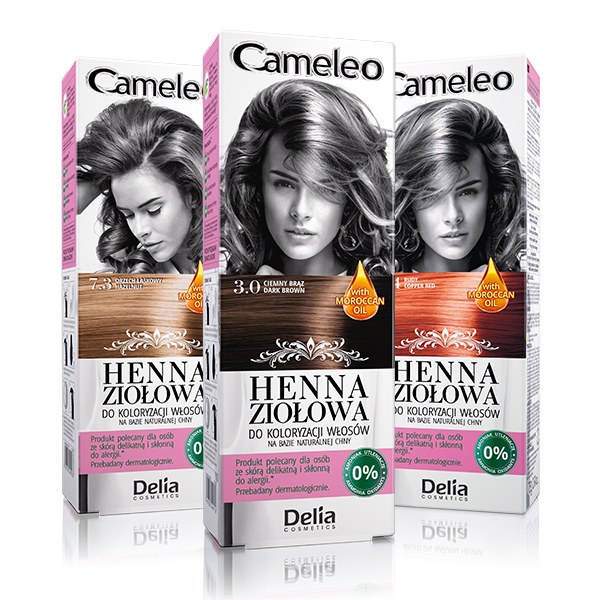 Additionally, Cameleo Herbal Henna is enriched with Moroccan oil, called “the gold of Morocco”, which regenerates and strengthens the hair already during the color-treatment. 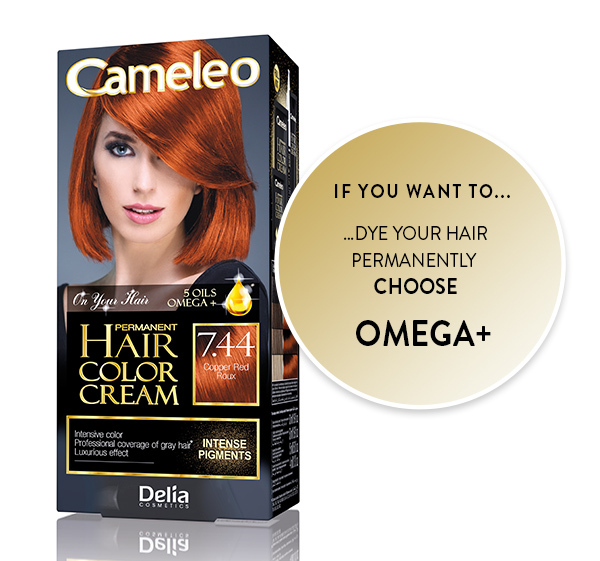 Omega + permanent hair color provides an intense, multi-dimensional and durable color. The package includes a sachet of hair serum – a unique blend of 5 beautifying and protecting oils. 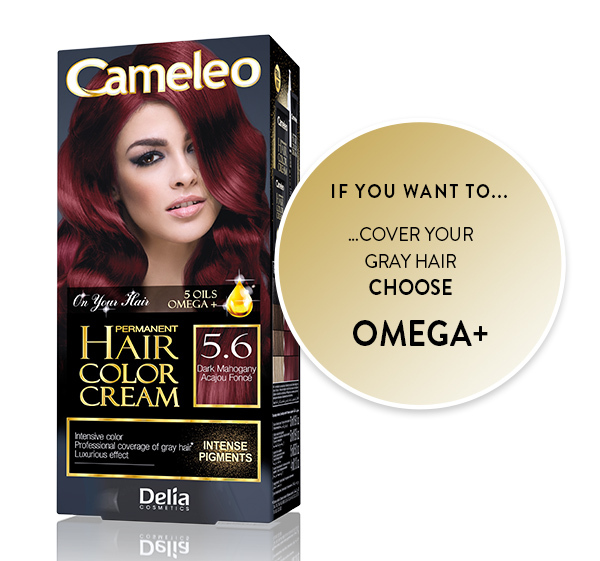 A wide range of available shades and professional coverage of gray hair allows you to achieve the hair-salon effect at your home! 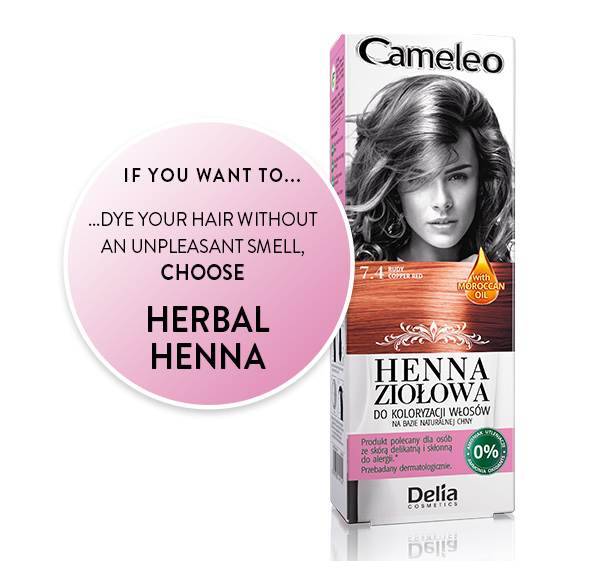 Besides dyeing, Herbal Henna also nourishes your hair and fills in the micro-damages. Because it does not penetrate to the core of the hair, it does not affect its structure. Instead, Herbal Henna gently coats the hair, which makes it thicker and stronger, resulting in beautiful shine and color depth. Omega + permanent hair color provides double color protection thanks to the addition of natural-oil hair serum and creatine balm. 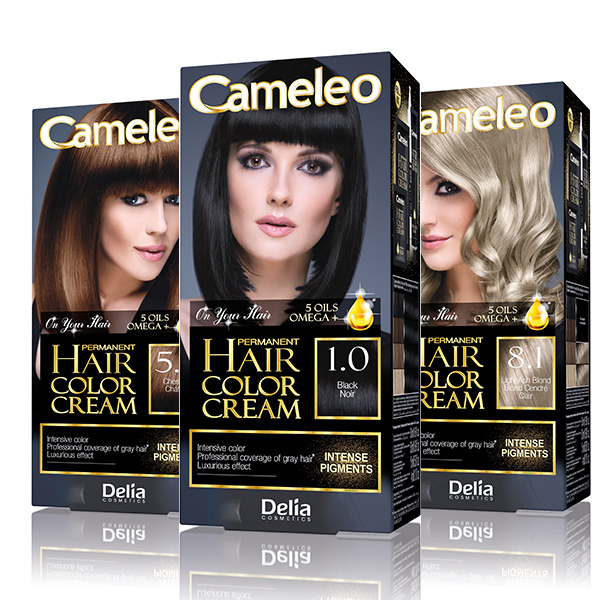 The product does not damage your hair, and in addition it nourishes, regenerates and protects your color. Due to the lack of natural melanin, gray hair is extremely unsusceptible to dyeing. It is thicker than normal hair, stiff and has difficulties receiving a color. If you have quite a lot of gray hair, choose a permanent hair dye. Herbal Henna will cover the first gray hairs, but they may have a lighter shade than the rest. 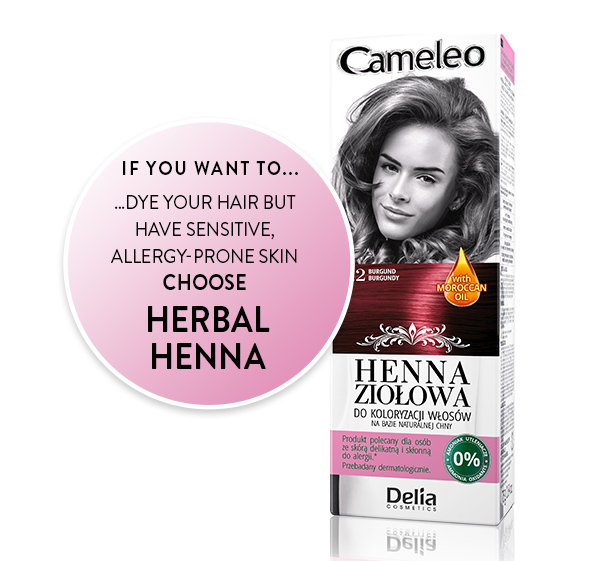 The color range of Herbal Henna includes mostly dark colors (it is due to the natural dark green, gray and brown color of henna). If you are a natural blonde or have bleached your hair by 2-3 tones you can use number 7.0 Blonde. Remember, however, that this is a herbal hair color and the blonde you will achieve will have a warm, sunny tone. 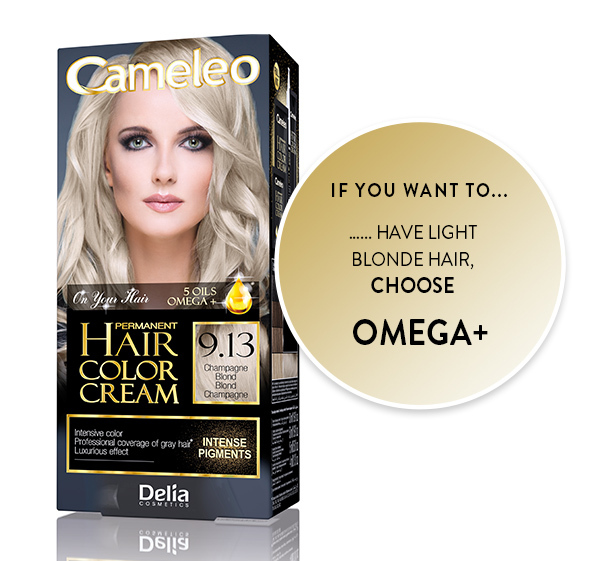 If you dream of a cool blonde with silvery tone, use Omega + or Cameleo hair bleach. Herbal Henna is ready for use, there is no need to squeeze it into a bowl, mix with the developer and apply with the brush. Just squeeze the cream directly on your hair, massage gently and leave for approximately 30 minutes. To apply the henna you do not have to wear plastic caps or towels. Henna will work the same without them. Herbal Henna is a hypoallergenic product, dermatologist-tested. 100% of respondents with a delicate and allergy-prone scalp confirmed that it does not cause irritation. Nevertheless, before every color-treatment always conduct a skin sensitivity test! 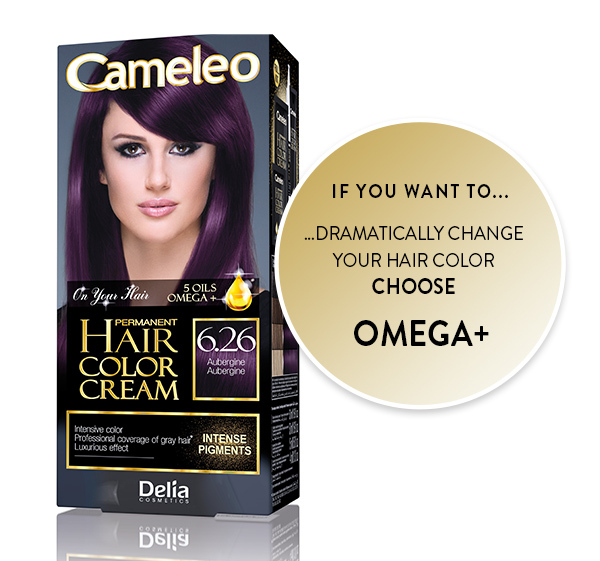 If you want to darken your color or dramatically change its shade, choose Omega +. To turn from a brunette to a blonde, you always have to use a decoloring or bleaching product. 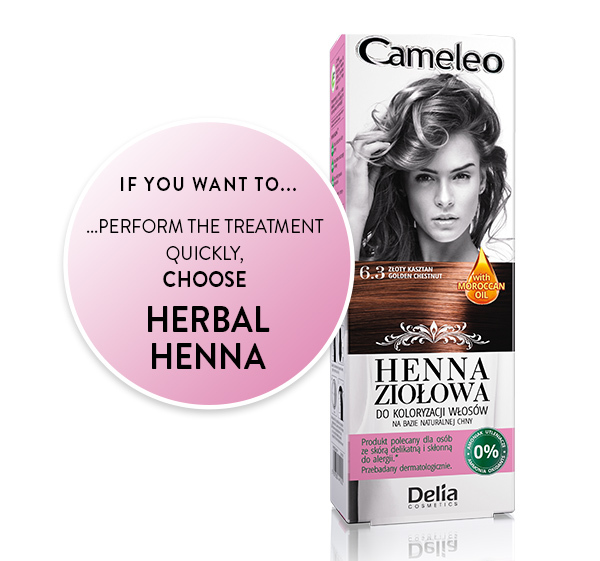 Keep in mind that Herbal Henna is a tone-on-tone coloring, which means you can change your color only by 2-4 tones. It is the perfect starting point for people who have never color-treated their hair before. You can check the result without the risk of permanent hair dye. 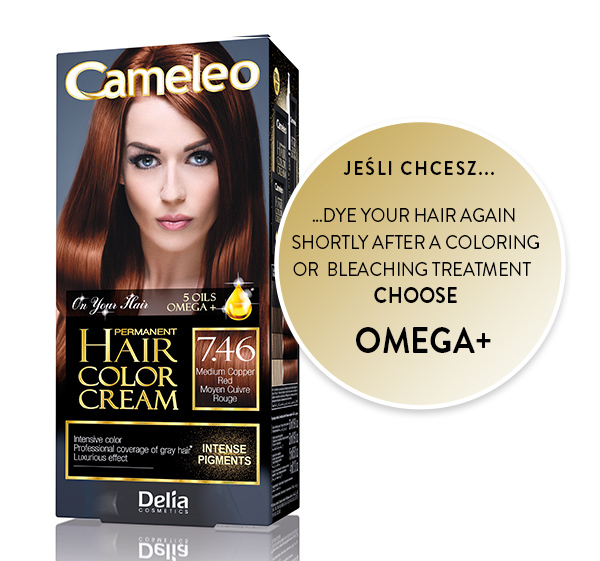 Omega+ is a permanent coloring product, level 3 according to the professional numbering system of color durability. Herbal Henna is a semi-permanent coloring (level 1). The color comes off gradually and after every shampoo it becomes slightly lighter. 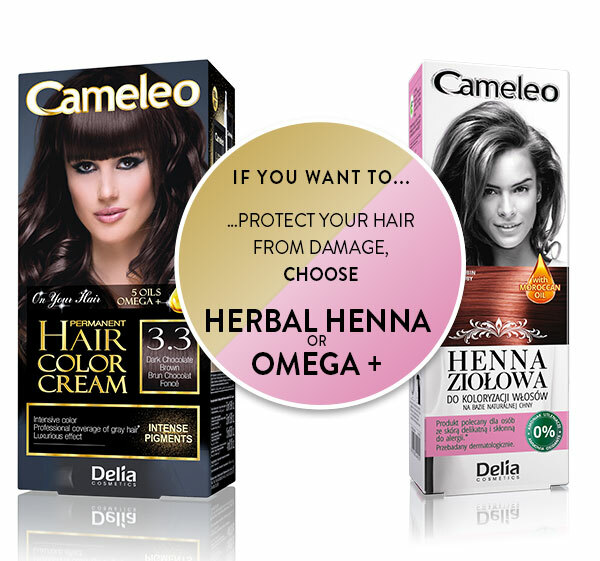 To use Omega+ hair color you do not have to wait the minimum of 2 weeks after chemical bleaching treatment, perm or color treatment as is the case with Herbal Henna. If you want to use the henna wait for at least 14 days, otherwise the outcome color may differ significantly from the expected one. But be careful not to mix cool and warm shades together. You should also avoid mixing dramatically different colors, blonde with dark brown for example. In this case, the darker color always dominates, and its shade can be unpredictable. If you have short hair or color only the roots, you can save the remainder of the cream for the next time. If you screw the tube thoroughly, henna will retain its properties.In the case of permanent hair color, use the mixture as soon as you prepare it, because it undergoes an oxidation process. Since henna does not contain ammonia or oxidizing agents, it has no irritating odor. Instead, it has a very delicate, herbal scent, which makes coloring a pleasure. 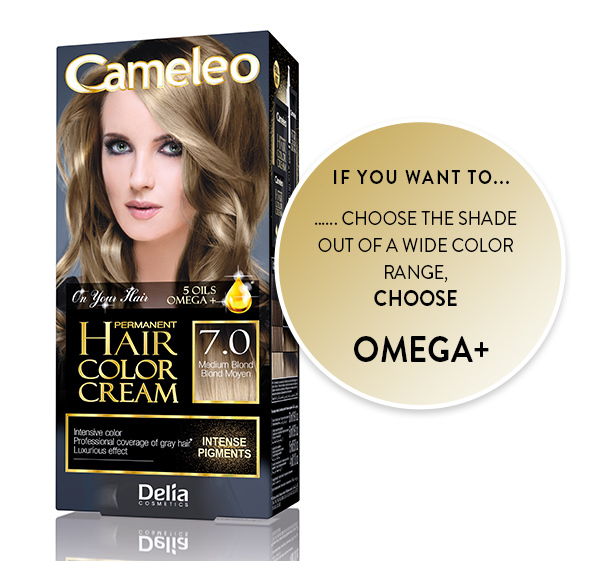 Omega+ color range contains as many as 27 colors – from silver and ash blondes through intense reds and warm browns, to the deep black. Both products are a perfect example of a good-quality hair color product which does not have to cost a lot! Do you know which product to choose yet? If so, have a look at our tutorials, which will help you with proper application and ensure a spectacular effect. If you have any questions, write to us on Facebook – we will gladly answer you!